The 2019 USA All Star Championship is off to a great start and the Level 3 divisions are showing out! The Day 1 results for level 3 teams have been announced and teams are back today for one final performance. The Level 3 Youth, Junior and Senior team divisions are always filled with talented programs. Will these teams hold the top spot, or will someone new take their place? Check out some of the first place standing routines from yesterday! 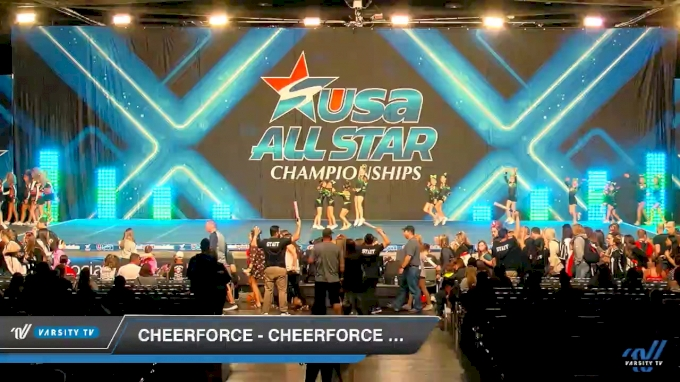 CheerForce San Diego Craze isn't too far away from home and they're here to take the crown! The team had a flashy opening with strong standing tumbling. Craze showcased difficult and well executed stunts that secured them the top spot. Will they do it again on day 2? Check out the Live stream at 5:27 PM PT! SCV All Stars Junior Black is also close to home with their gym stationed in Valencia, California! The team had synchronized tumbling that had the crowd on their feet, followed by fun and solid stunts. Can Junior Black keep their top spot? Stay tuned to find out! SCV All Stars Senior Blue from Valencia, California opened their routine with a strong coed stunt and a variety of difficult tumbling! The team showcased strong stunts that secured the top spot after Day 1. Will Senior Blue top the Level 3 Senior division? Watch them perform their final routine at 1:30 PM PT! It's the final day at the 2019 USA All Star Championship! We can’t wait to watch these teams take the mat, and you can too by watching LIVE on Varsity TV!